For me, this is a taste of sunshine at any time of the year. Whether you enjoy a slice al fresco with a cool glass of something bubbly or wrapped up indoors with a cup of tea, this is a heavenly bake. This is also a BIG cake – this makes a lot of mix and very deep layers of cake. You will not complain, just make sure that your tins are at least 2″ deep. This cake works brilliantly filled simply with Classic Vanilla Buttercream (add a couple of tablespoons of lemon curd to make it lemony) or covered with elaborate Italian Meringue. Cream the butter and the sugar until almost white. This is best done in a free-standing mixer, to avoid a very tired arm! Combine your dry ingredients in a separate bowl and set aside while the butter creams. Beat the eggs in a jug and add the lemon zest and juice to this. Gradually incorporate this mixture into the butter and sugar, mixing all the time and adding a teaspoon of your dry ingredients if the mix begins to curdle. Gently add the dry ingredients to your wet ingredients until just combined. Mix through the lemon curd until fully incorporated. Divide the mixture between two lined sandwich tins and bake for approximately 45 minutes. The cakes are done when a skewer comes out clean. Heat the lemon juice and sugar in a saucepan over a low heat, stirring occasionally, until the sugar has completely dissolved and the syrup is perfectly translucent. As soon as you remove the cakes from the oven, poke them right down to the bottom of the tin in several places with a skewer. Really go for it and pour all of the syrup over the top of the cakes but leave each pouring of syrup to soak in before you add more rather than allowing a puddle to collect on top. Leave the cakes to cool in their tins for 10 minutes before turning out on a wire rack to cool completely. Sandwich your cake layers together with Classic Vanilla Buttercream, a cheeky added tablespoon or two of lemon curd will make it lemony buttercream. 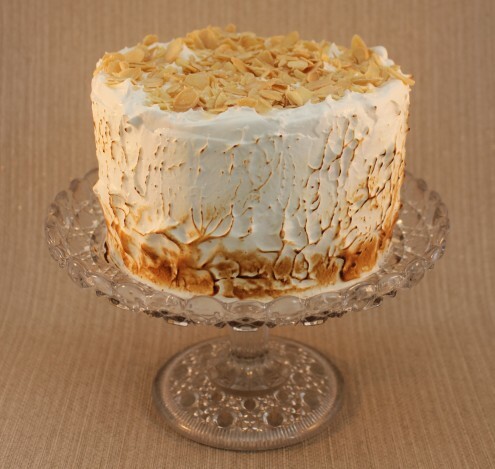 Leave it there, cover with more buttercream, or go all out glamour and cover with Italian Meringue and a scattering of flaked almonds for the ultimate finish!